The Flex Pro and Fitness Championships are the first IFBB Professional Contests of the season to be kicked off in the home of bodybuilding – Santa Monica, Ca. 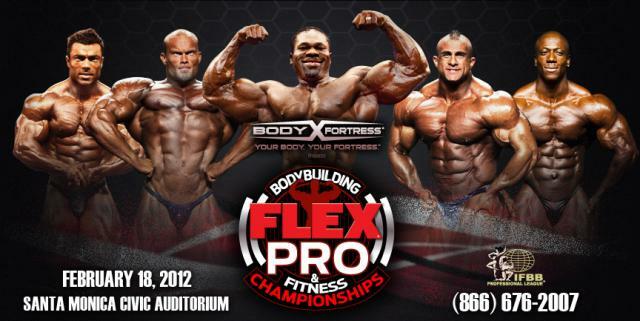 The FLEX Pro is back, and Year Two promises to be one of the highlights of the 2012 IFBB Pro League season! Presented by Body Fortress, the FLEX Pro will kick off 2012 by showcasing the IFBB’s elite – in both bodybuilding and fitness! This year, FLEX Pro present some of hottest up-and-comers in the sport today. Lionel Beyeke, Fouad Abiad, Ben Pakulski, Brandon Curry, Shawn Rhoden and Eduardo Correa all will look to answer the age-old question of “Who’s Next?” when the FLEX Pro comes to the Santa Monica Civic Center on February 18. Just a stone’s throw away from the best place of Bodybuilding, it’s a star-studded event you won’t want to miss.